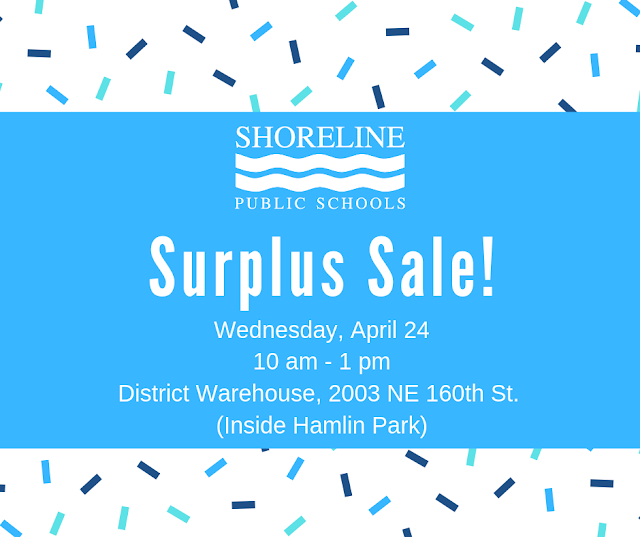 Shoreline Public Schools will hold a public surplus sale on Wednesday, April 24, 2019 from 10:00am – 1:00pm at the District Warehouse, 2003 NE 160th St., Shoreline (inside Hamlin Park). No computers or vehicles are included in this surplus sale. Purchased items must be picked up no later than 1:00pm on Thursday, April 25, 2019. Payments for items can be made with cash or credit card. Sales are final, as-is, where-is, no returns, no refunds. The District will not be liable for injuries or damages to items, property or personnel incurred during the moving and/or subsequent use of the items.